Traveling solo, especially as a female, can be a very exhilarating but also nerve-wrecking experience. You get to see the world from your own eyes but sometimes you might wish that someone was there to share the experience with you. As a woman, it's an even bigger deal because of everything we have to deal with in regards to our own personal safety. Although I didn't actually travel through Australia by myself, it was my first travel experience of any kind alone. In the past, I have traveled with friends and family of course, but never by myself. I had heard so many fun stories of traveling alone and meeting great people along the way, but I've also heard of the horror stories of the ways women are treated when traveling. + You get to see the world from your own perspective and no one else's. When you travel with other people, your judgment or opinions or traveling a certain way or going to a certain place can get clouded if you are with others. Their opinions might overpower or influence yours to be different than what you may have thought if you were alone. If you're alone, your opinion of a place is completely yours and you get to see what you want when you want it. You have the option to choose exactly what you want to do, and whatever comes from it will shape your opinion and nothing (and no one) else. + You get to meet some really interesting people. Whether you are traveling by plane, boat, or car, you are going to meet different people along the way. Especially if you are on a plane or boat by yourself, take advantage of it! Those people don't have a choice but to talk to you, haha. One of my professors said that planes are the best places to network with people, so do it! When I went to Australia and back I was on four different planes because of layovers in Hawaii, I sat next two four different people (although on the last flight I fell asleep and woke up and the guy was gone), and I had the chance to talk with them about themselves and why they travel and things like that. It just so happened that all of them were older adults, so they definitely had a lot of wisdom and life experience to offer me. I wish I had a better mix of older adults and people closer to my age but I still enjoyed talking to them nonetheless. + It teaches you to be responsible for yourself. 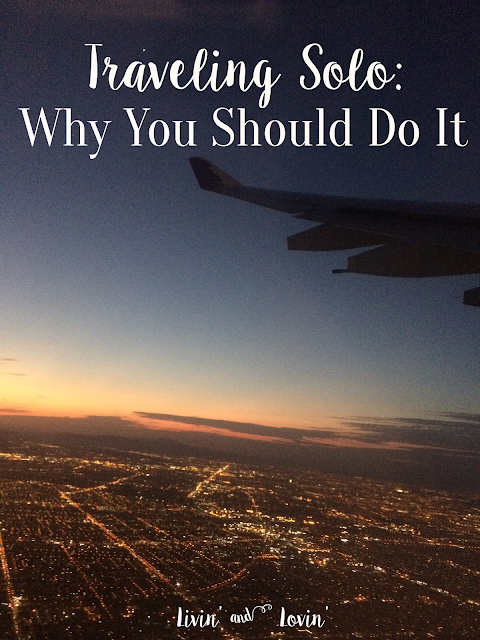 Even if someone booked the whole trip for you, once you get past security you're on your own. Only you can get you to your gate and into your seat (if its assigned). Only you can be responsible for your own passport. Only you can be the one to recognize your suitcases from the baggage claim (and if you're lucky like me, make a friend to get it for you if it's as heavy as mine was). If you are doing the whole trip by yourself and not just the actual traveling part, then you are also responsible to get your accommodations set up (and to make sure you are able to get there too). *I know that the recent events around the world have shaken some peoples' thoughts about traveling but I say that it shouldn't stop you. What happened in Paris and many other countries on that day could've just as easily happened in your neighborhood. So while it's definitely important to be cautious, don't let that hold you back from traveling completely! If you do decide to travel to one of those affected places such as Paris in the next few weeks or months, if anything, it'll be the safest time to go because security will be at an all time high! So go travel and see the world. See the world by yourself if you can. It is such a great experience and you'll be glad you did.